Examples of organisms and trajectories observed in sackhole brines of Malene Bay, Greenland, using digital holographic microscopy. 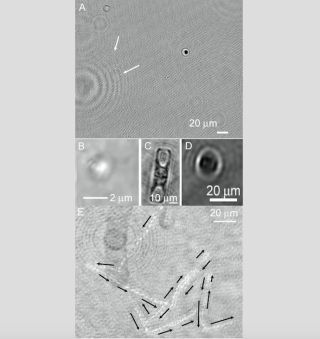 (A) Appearance of a nearly full-screen image containing objects suggestive of bacteria (arrows). (B) Zoomed-in appearance of a single bacterial cell. (C) Amplitude image of non-motile diatom. Note the clear resolution of cell walls and nuclei. (D) More slowly swimming, typical photosynthetic algal cell. (E) Zig-zag motility of a bacterium, observed as a projection through 60 seconds of time. The first evidence of alien life may be recorded as a hologram. Scientists have detected microbes in Greenland sea ice using a specially built digital holographic microscope, suggesting that the instrument could have similar success on icy moons in the outer solar system, if any of them harbor life. "This was designed from the beginning to have a path to flight," said Chris Lindensmith of NASA's Jet Propulsion Laboratory in Pasadena, California, who presented the team's latest results last month at the annual fall meeting of the American Geophysical Union (AGU) in San Francisco. "We're ready to jump up and say, 'Pick us! Pick us!'" Digital holographic microscopy (DHM) uses the interference of light (which is produced by an internal laser) to record information about an object as a hologram. A computer then uses this information to construct a viewable image of the object. Digging the digital holographic microscopy unit into the sea ice during a field trial near Nuuk, Greenland. DHM has several advantages over ordinary imaging microscopy when it comes to possible use on a space mission, Lindensmith said. For example, it's easy to make DHM instruments autonomous; there is no need for knob-twiddling to bring a target object into sharp view. "The thing that makes it magic is, we don't have to do any focusing," Lindensmith told Space.com at AGU. "We can reconstruct any image in the object field." DHM images can be recorded in the form of videos, which allow researchers to detect microbe motility — one of the least ambiguous signs of life. The team built a field-ready DHM system that’s about the size of an airplane carry-on bag, then put it to the test last March in three different sea-ice sites near Greenland's capital city, Nuuk, which lies on the giant island's southwestern coast. The results were extremely promising, Lindensmith said. The instrument was able to resolve objects smaller than 1 micron (or 1 millionth of a meter), and it detected moving eukaryotes — organisms whose cells contain a nucleus and other membrane-bound organelles — in every single one of the more than 100 sea-ice samples it examined. "Big eukaryotes — those things just scream out," he said. The story was a bit different for the prokaryotes — organisms such as bacteria that have no nuclei or other membrane-enclosed internal structures. Most of them were not moving upon initial observation, and when motionless they were tough to tell apart from random debris. However, the researchers were able to induce prokaryotic movement by adding the amino acid serine to the samples. The DHM unit's performance in the Greenland ice could make it an intriguing contender for future life-detection missions to moons such as Europa and the Saturn satellite Enceladus, both of which possess global oceans beneath their icy shells. Close-up of the digital holographic microscopy unit during field trials in the sea ice near Nuuk, Greenland. NASA is already developing a Europa mission, a $2 billion project that's scheduled to launch in the early to mid-2020s. The as-yet-unnmaned spacecraft will perform 45 flybys of Europa from Jupiter orbit over the course of 2.5 years or so, assessing the moon's habitability with nine different science instruments. The Europa spacecraft's payloads are not set in stone yet; NASA is considering adding a lander to the mission, possibly to hunt for signs of life on or near the moon's surface. If the agency does decide to go this route, a DHM unit would make a lot of sense, Lindensmith said; the microscope could be integrated into an instrument suite that also contains spectrometers, which would perform chemical analyses of target samples to complement the imaging work. There shouldn't be any trouble getting a DHM instrument ready to go in time for the Europa mission's launch, he added. The unit that got a workout in Greenland last year is already nearly in "space mode," and the team should have a design for a bona fide flight version laid out by the end of February, Lindensmith said. NASA's Hubble Space Telescope spotted signs of a plume of water vapor emanating from Europa's south polar region in late 2012 (though future efforts to confirm the plume have not been successful), and geysers near Enceladus' south pole continuously blast out large amounts of water ice, organic compounds and other material. A DHM instrument could theoretically search for signs of life in Europa or Enceladus plume material collected during flybys, Lindensmith said, but such work would pose challenges that a lander-based instrument wouldn't face. For example, plume samples would be very small, so the odds of seeing something interesting would be lower. Further, plume material would be snagged by a spacecraft at high velocity, possibly killing and/or destroying any cells that were picked up.